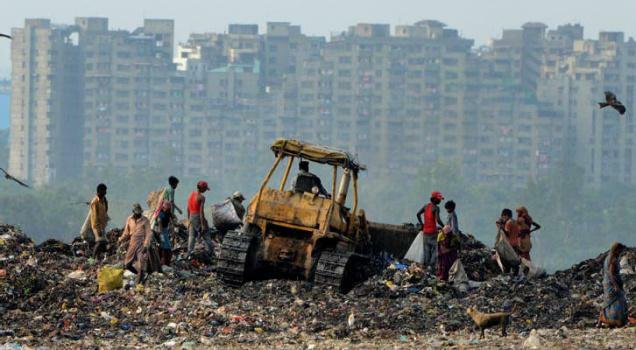 Have you seen the several storeys high landfill in Delhi at its border with Uttar Pradesh – Gazipur, a prime land! It’s a mountain of garbage now. How does the garbage reach the landfill and what will happen when this place is all filled up? Does our food waste also contribute to our garbage mountains? May be we all know very less about what happens to the garbage we throw away on the streets and some in black plastic bags. In India, the National Solid Waste Association of India (NSWAI) is the leading professional non-profit organisation in the field of solid waste management including toxic, hazardous and also bio-medical waste. The general waste from our homes reaches the dumpsters and then is taken to the landfills where it is segregated. A staff of almost 46,000 people in total is allotted for this. Rag pickers separate the different articles in the garbage and make piles. The wet waste is sent to compost plants and the rest dumped at the landfills. It would be a lot simpler if the government had stricter rules, says Mahima Gutru, who has been living in Germany. “Germany has got a very efficient garbage disposal system. We have to separate things at source.” The garbage bin which is collected there weekly, all wet garbage, and non recyclable plastic goes in it. Yellow is the colour for recycle. “We have to collect these special yellow bags (free of cost) from the local municipality office. All recycle bottles, packaging, milk and yogurt packs also go in it. It is collected every 15 days. Paper bin is blue in colour and all paper including cartons goes in it. It is collected monthly. All juice plastic as well as glass bottles which have special recycle symbol have to be returned in special centres which are usually there in all supermarkets. You get your money back which has been taken as a deposit from you when you bought those bottles,” she says. Doesn’t that make the process so much simpler? Why can’t we do that in India? According to Delhi Government report of the Department of Environmental Issues and Solid Waste Management, approximately 8000 tons of municipal wastes is generated daily in Delhi. Leicester (England) has a population of about 4, 50,000 people. They have a weekly rubbish collection by the City Council (the local authority) which has two streams of rubbish collection (for which they provide with respective type of bins) for general waste and recyclable waste collected weekly. Dr. Rashmin Tamhne, a resident there, tells that there are ‘tips’ at a few city locations for special rubbish, including things like old electronic equipment, metal waste etc. These are sent off for re-conditioning and re-melting. “The sewage disposal is invisible to us citizen. It was built almost as a national programme in the 18th century. It’s that system, created so long ago, that helps service the population,” Dr. Rashmin says, adding that disposal of any sewage or rubbish into rivers, or anywhere public, is strictly illegal, and punishable by law. In India, the quantity of waste is increasing every minute and in this way there will be more landfills and compost plants than parks and houses. We all just might end up living in a world full of crap. If only we could separate the garbage at home itself and not litter on the streets! Meanwhile, UNEP – the UN’s environmental programme – is warning of a global garbage crisis. It says a staggering 1.3 billion tonnes of waste is generated each year, posing grave danger to clean water, clean air, and safe food and jeopardising overall public health. The National Capital Territory of Delhi should lead by effectively managing waste (and converting it to energy for some real use), it is hoped. A study conducted recently with the help of United Nations Development Programme already indicate that ways to refuse derived fuel is a good option for management of solid waste of Delhi. Or has the Delhi government found a solution to tackling the ever-increasing piles of waste!